Air Asia India’s first aircraft, Airbus A320-216SL, registered VT-ATF (MSN 6015), has finally departed Toulouse (ICAO: LFBO, IATA: TLS) for its final destination Chennai (ICAO: VOMM, IATA: MAA). The ferry flight will however make one stop at Ankara’s (Turkey) Esenboğa International Airport (LTAC). The aircraft is expected at Chennai at 09:30hrs IST (UTC+05:30) on 22nd March 2014. 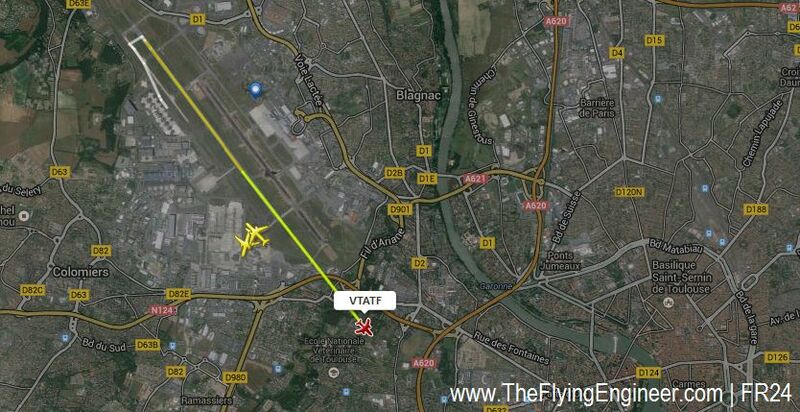 The callsign is the aircraft’s registration, VT-ATF. The ferry flight is finally taking place after 9 days, due to issues the airline had with the DGCA that prevented it from ferrying it on the 12th of March 2014, as covered earlier here. The 9 day delay will have an effect on the start of operations. With this aircraft, the airline can undertake the last hurdle in the grant of the AOP: Route proving flights. With the AOP expected in April, operations may start either late May or early June. The airline can start selling tickets only after the AOP is granted and flight schedules approved. No information is yet available on the second aircraft, which is reportedly planned to be registered as VT-ATB. The aircraft’s MODE-S transponder’s ICAO 24 bit unique aircraft address’ Hexadecimal code is 800B09. The ferry flight was assigned a squawk (transponder) code of 4041 by Toulouse, which is subject to change as it passes through different flight information regions. Update18: Aircraft landed at 0400hrs UTC (09:30hrs IST), with a 0 minute delay, on runway 25, Chennai. Exited via taxiway F. Water cannon salute to be followed by flag waiving. Flight time LTAC-VOMM 06:43hrs. 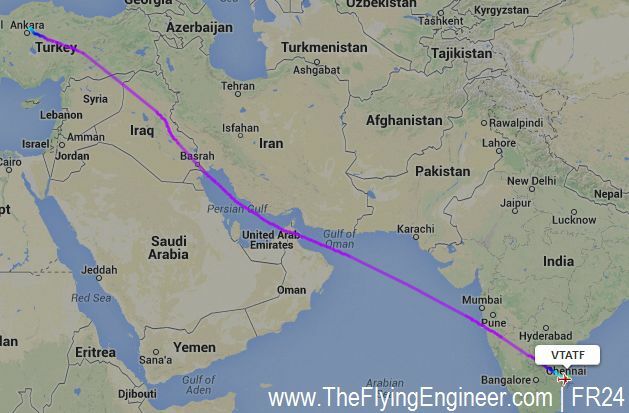 Update16: Aircraft leaves Mumbai flight information region and enters Chennai FIR at 0243hrs UTC. Update15: Aircraft enters Indian mainland over the western Indian coast, over the coastal town of Guhagar, 215km south of Mumbai, Ratnagiri district of Maharastra, at 0231hrs UTC. Update14: Aircraft is in Mumbai FIR, waypoint PARAR, at ~0115hrs UTC. Another 1.5hrs to the Indian coast. Squawk is 1101. Update13: Aircraft refuels, and departs Ankara’s Esenboğa International Airport, airborne at 2117hrs UTC. Spends total 01:19hrs on ground including taxi in/out. Squawk 2514. Update12: Established ILS for 03R at 1955hrs UTC. Aircraft landed on runway 03R at Ankara’s Esenboğa International Airport (IATA: ESB, ICAO: LTAC) at 1958hrs UTC. Expected time on ground 30 minutes. 03:32hr flight concludes stage one of the ferry. Route is shown in image above. Update11: Aircraft begins descent from FL390 at 1935hrs UTC, ~100NM from Ankara. Update10: Aircraft enters Turkish Airspace at waypoint RIXEN at 1918hrs UTC! Update09: Aircraft enters Bugarian airspace at 1839hrs UTC. Update08: Aircraft brushes past the northern tip of Montenegro, and enters Serbian Airspace at 1817hrs UTC. Update06: Aircraft crosses over into Croatian Airspace at 1747hrs UTC. Update05: Aircraft leaves Italian Coast at 1742hrs UTC. Winds slow acft down to 438kts G/S. Update04: Crew witness twilight over San Marino, Italy, at 1736hrs UTC. Update03: Aircraft crossed into Italian Airspace at 1702UTC, 466kts, FL390. Squawk changed to 1212. Update02: Aircraft step climbed and reached FL390 at 1649hrs UTC. Update01: Aircraft is cruising at FL340 and maintaining a ground speed of 466kts.